Save a quick buck on a lavish high-res, low response time IPS panel, just in time for ray tracing on Pascal. With ray tracing about to arrive on our three-year-old Pascal graphics cards later this month, we can all take a breath in unison to celebrate the fact that we don't have to pledge allegiance to Nvidia's RTX promise. Instead, we can take the money we would have otherwise spent on the best graphics card, and instead upgrade a core component in our PC gaming careers that far too often goes unappreciated. Namely the screen. 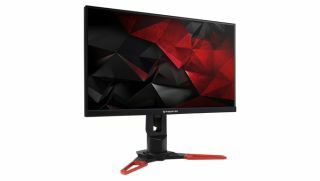 Somewhere down our rundown of the best gaming monitors is a gorgeous 4K panel whose adjustable stand and neck are bespattered with subtle crimson markings. It's a high style, low profile display called the Acer Predator XB1, and it's on sale for £549.99 on Amazon UK right now. Given that it's normally £749.99, by purchasing it now, you're saving yourself £200, or 27 percent, later. That's just basic science. More specifically, it's the 27-inch 4K model that's on sale right now, as the Acer Predator XB1 is available in a variety of sizes, resolutions, and refresh rates. So while it's not the fastest at 60Hz, it does boast a 4ms response time, relatively low for an IPS panel. And though it lacks HDR support of any kind, the Acer Predator XB1 we're eyeing tries to accommodate Nvidia loyalists by offering native G-Sync support. At this price, you'd typically have to comb through the best G-Sync Compatible FreeSync monitors for a taste of that sweet tear-free adaptive sync life. But because you're getting it at a pretty significant markdown, you don't have to enable a workaround to eliminate microstuttering and jaggies. Instead, we suggest clicking through one of our links, and experience a world of difference when that Pascal ray tracing update finally lands at an unspecified date in April 2019.